Apple’s store fronts are famous for a few things, their symmetry and attention to design, a preponderance of glass, and for being the face of some of the most valuable retail spaces in the world. Now Thomas Park has catalogued every store with an address, opening date and photograph and put together a beautifully scrollable list. Park visited the first Apple store in Tyson’s Corner, Virginia in August of 2001, shortly after it had opened and it left a lasting impression on him. In an effort to see how Apple’s Retail Store empire had grown and evolved since then, he collated all of the images from Apple’s website along with opening dates supplied by IFOAppleStore and created a LazyLoad gallery of them all. It’s a really cool list and its arranged in order of store opening, so you get an interesting look at the relative evolution of the store designs over time, although some have been redone since first opening. Some of the images are missing as there are several stores undergoing renovation at this time, but its a remarkably complete list overall. 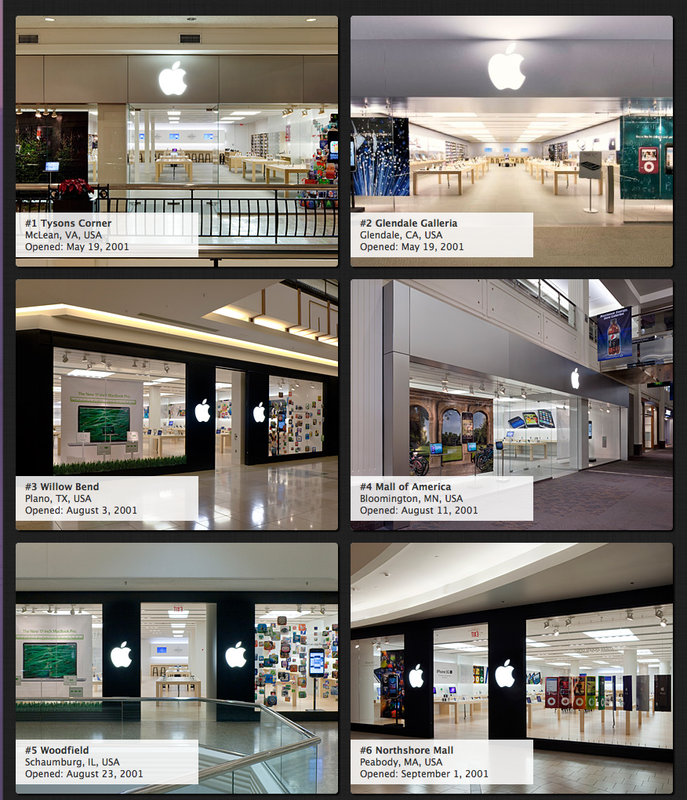 Is one of these Apple stores in your town? If you’ve visited several, which one is your favorite?